Rest Easy with the Four In One Memory Foam Pillow. Designed with your comfort in mind, the Four In One Memory Foam Pillow has four uses, each critical for soothing neck, back and leg support. 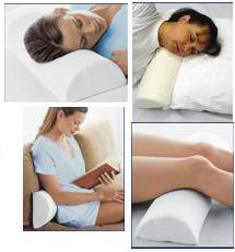 The Visco Elastic Memory Foam will reduce pressure, tension and provide you with support and comfort every night.